Brugmansia Charles Grimaldi is a full sized shrub or small tree. Brugmansia will readily grow to 12-15 feet tall and wide It will grow in sun or shade but Brugmansia's are tender in frosty conditions and will die if temperatures drop very far into the 20°s F. Brugmansia Charles Grimaldi has large single gold flowers with points that are strongly recurved and very fragrant. 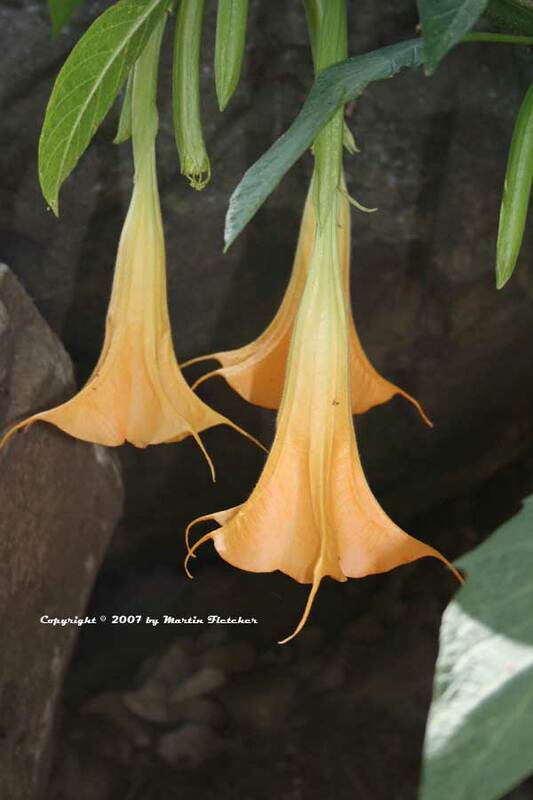 While Brugmansia may like a bit of water, this plant is quite forgiving in the ground and will put up with rough transplants and irregular water schedules once established. Brugmansia Charles Grimaldi will put on waves of blossoms Spring through Fall. I haven't tried this but it is said that you get strange dreams when sleeping under a Trumpet Tree. Not so surprising when you take note that all parts of Brugmansia Charles Grimaldi are poisonous. Flowers and foliage of Brugmansia Charles Grimaldi. High resolution photos are part of our garden image collection.